Last night, I did a little mini-tour of my studio on Instagram, so I thought I'd share here too in case you missed it! I've been working on it by adding a few more pieces here and there. It's just a great place to go and work and have everything I need in one little space. I always feel just a bit more inspired when I'm in this studio, which is exactly what I need sometimes! Enjoy! Find your space. Find a little spot in your home you can set aside for a workspace. It can be a small desk in the corner or a full room... just find a place that you won't have to tear down, that can be yours. I'm lucky enough to have a little nook in one of our rooms that I devoted completely to my blog studio - and it's helped so much with my productivity! Organize your space. 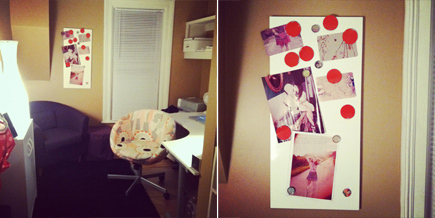 When I put together my studio, I emptied the nook and put everything back very carefully. I got rid of everything I didn't need and bought new things that I knew would help me. Especially all of my boxes with labels, file cabinets and desk. 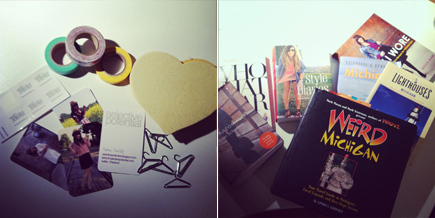 I keep a lot of stuff (I'm sentimental with my blog!) and it doesn't seem like it, because I keep it all really organized. Add fun touches and reminders of why you love what you do. 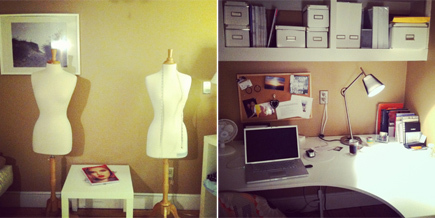 With me, I use my studio for blogging, so I've added so much of my blog into my studio. 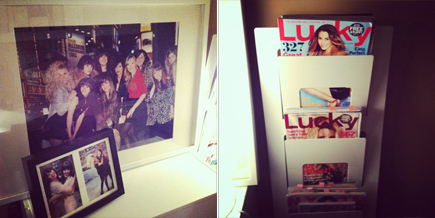 Photos with my blog friends, memories from fashion week and blogger meetups, pictures of features I've been in, framed maps of the Delightful Dozen addresses, pictures/notes I've received from readers, inspiration from magazines, books of style bloggers and places in Michigan I want to go, etc. 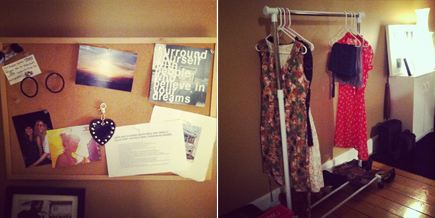 Every time I step back into my studio, I am quickly reminded why I love blogging so much and it inspires me! Keep your space cozy. That's a huge deal for me because I spend so much time working... that I need a comfy place. I have a comfy chair, fuzzy blanket, low-lighting and a nice guest chair and stool for Brett to keep me company once in a while. I love coming back here to work and it's because it's the right environment for my work style!